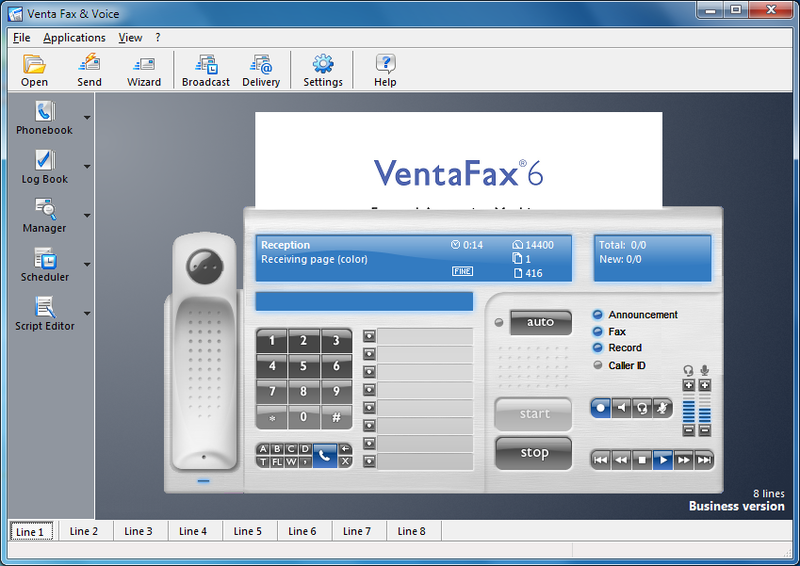 The VentaFax Multi-Line version can operate several modems simultaneously. There are program modifications for 2, 4, 8, 16 and 32 telephone lines. It is recommended that versions supporting 8 telephone lines and more be run under Windows 8, 7, Vista, XP or 2000 operating systems. Most of the settings can be set for each telephone line independently. To select the desired telephone line in the program settings window, click on the corresponding button at the bottom of the window. The current telephone line state is displayed in the Main Application window. To select the desired telephone line, click on the corresponding button at the bottom of the window. If you need to keep an eye on the state of all telephone lines, select the View � All lines menu item. Automatic reception mode can be enabled independently for each telephone line. When reception and transmission are manual, the current line is used. The schedule created by the program is common for all the available telephone lines. Scheduled delivery mode can be enabled independently for each line. If scheduled delivery is enabled for several telephone lines, messages are sent via all of the selected lines. The program makes sure that no task is performed simultaneously on a number of lines. If for some reason a message was not sent, any of the free telephone lines can be used to send the message upon the next attempt. Voice messages are transmitted only via the modems that have voice functions enabled. If you use fewer telephone lines than the program supports, lines not required can be deactivated in the Active lines list under the Miscellaneous � VentaFax Engine tab. Deactivated telephone lines are unavailable for selection. By default the telephone lines are named Line 1, Line 2, etc. To change a telephone line name, right-click on the telephone line selection button. In the context menu, select Rename. Type in the new name and hit Enter. By default all telephone lines share the same telephony location selected in your system. However, each line may require its own telephony location when, for example, different telephone lines require different prefixes for outgoing local or long-distance calls. Such telephony locations must first be created in the system. To do this, click on the Edit button under the Transmission � Dialing tab and create a new telephony location. If necessary, use the Windows Help system. After all locations have been defined you can select the one required for each telephone line from the Location list under the same tab.